Arsenal won their last 8 games in Premier League. Chelsea allowed opponents to score over 1.5 goals in last 8 games in Premier League. Manchester City has over 2.5 goals in their last 3 away games in Premier League. Arsenal won their last 3 away games in Premier League. Chelsea scored in last 3 games in Premier League. Manchester City won their last 3 away games in Premier League. Arsenal scored in last 6 away games in Premier League. Manchester City scored in last 6 away games in Premier League. Real Betis scored in last 4 games in La Liga. Espanyol won their last 3 home games in La Liga. Real Betis won their last 3 games in La Liga. Atletico Madrid scored in last 5 home games in La Liga. Espanyol allowed opponents to score over 1.5 goals in last 8 home games in La Liga. Eintracht Frankfurt scored in last 6 away games in Bundesliga. 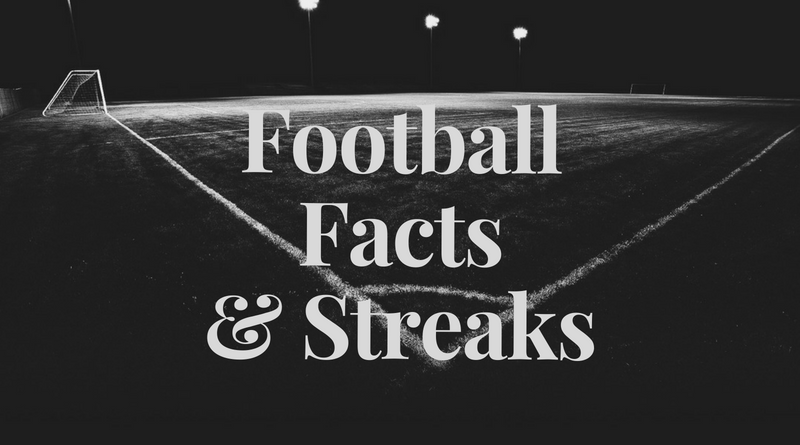 Genoa won their last 5 home games in Serie A.
Spal 2013 lost their last 4 games in Serie A.
Inter scored in last 5 away games in Serie A.
Atalanta didn’t score in last 3 home games in Serie A.
Sampdoria allowed opponents to score over 0.5 goals in last 3 away games in Serie A.
Chievo lost their last 3 games in Serie A.
Milan scored in last 14 games in Serie A.
Genoa scored in last 8 home games in Serie A.
Atalanta has under 2.5 goals in their last 3 home games in Serie A.
Sampdoria allowed opponents to score over 1.5 goals in last 7 games in Serie A.
Genoa scored in last 8 games in Serie A.
Spal 2013 has under 2.5 goals in their last 4 home games in Serie A.
Inter won their last 7 games in Serie A.
Genoa allowed opponents to score over 1.5 goals in last 6 home games in Serie A.
Atalanta allowed opponents to score over 1.5 goals in last 6 home games in Serie A.
Milan has over 2.5 goals in their last 3 home games in Serie A.
Chievo has under 2.5 goals in their last 3 games in Serie A.
Milan scored in last 7 home games in Serie A.
Inter won their last 4 away games in Serie A.
Nantes scored in last 3 away games in Ligue 1. Monaco allowed opponents to score over 1.5 goals in last 3 home games in Ligue 1. Lyon has over 2.5 goals in their last 3 away games in Ligue 1. Paris Saint-Germain has over 2.5 goals in their last 20 games in Ligue 1. Bordeaux scored in last 8 home games in Ligue 1. Monaco has under 2.5 goals in their last 3 home games in Ligue 1. Nantes scored in last 4 games in Ligue 1. Monaco lost their last 4 games in Ligue 1. Paris Saint-Germain has over 2.5 goals in their last 19 home games in Ligue 1. Paris Saint-Germain won their last 5 games in Ligue 1. Rennes lost their last 4 away games in Ligue 1. Monaco didn’t score in last 4 games in Ligue 1. Paris Saint-Germain won their last 10 home games in Ligue 1. Sheffield Wednesday has over 2.5 goals in their last 3 away games in Championship. Bristol City has under 2.5 goals in their last 3 games in Championship. Sheffield Wednesday scored in last 6 games in Championship. Sheffield Wednesday scored in last 3 away games in Championship. Bristol City scored in last 3 home games in Championship. Ajax scored in last 6 home games in Eredivisie. Heracles has over 2.5 goals in their last 7 games in Eredivisie. Vitesse scored in last 4 games in Eredivisie. Ajax won their last 5 home games in Eredivisie. Heracles has over 2.5 goals in their last 3 away games in Eredivisie. Heracles won their last 5 games in Eredivisie. AZ Alkmaar has over 2.5 goals in their last 4 away games in Eredivisie. Ajax has over 2.5 goals in their last 5 home games in Eredivisie. Heracles scored in last 5 games in Eredivisie. Minnesota United scored in last 4 games in MLS. Colorado Rapids lost their last 6 games in MLS. Los Angeles FC scored in last 11 away games in MLS. Orlando City didn’t score in last 3 games in MLS. LA Galaxy has over 2.5 goals in their last 4 games in MLS. Philadelphia Union scored in last 8 home games in MLS. Orlando City lost their last 8 away games in MLS. LA Galaxy has over 2.5 goals in their last 7 away games in MLS. Sporting Kansas City has under 2.5 goals in their last 3 home games in MLS. Colorado Rapids has over 2.5 goals in their last 4 home games in MLS. LA Galaxy lost their last 3 away games in MLS. Sporting Kansas City scored in last 9 home games in MLS. Los Angeles FC scored in last 7 games in MLS.